Wildfire made history this summer, though it’s a record no one wants to celebrate or repeat. One after another, fires raced across Wasco and Sherman counties, burning hot and fast, moving miles in minutes with a force that consumed wheat fields in their prime, turned houses to ash and took the life of a farmer as he tried to save his neighbor’s land. 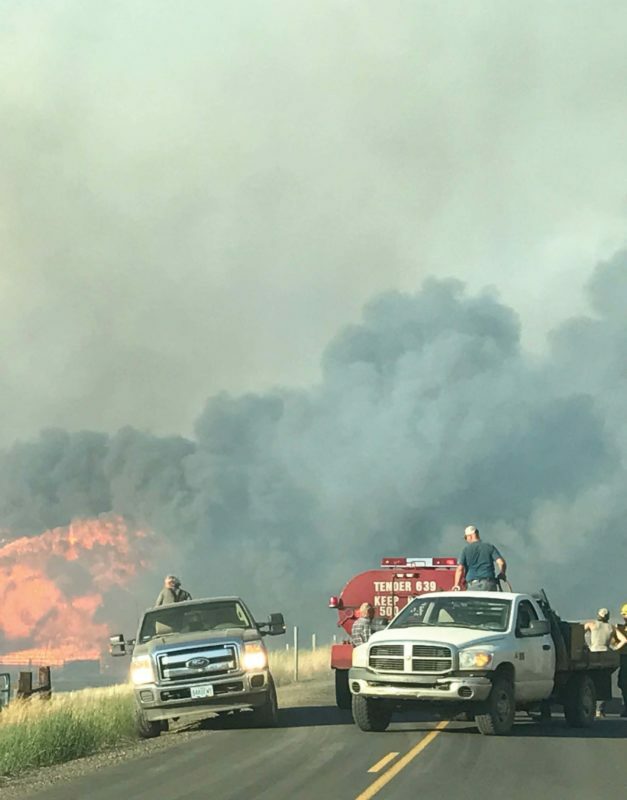 Unusually hot weather, driving wind and dry land helped fuel multiple fires in Wasco and Sherman counties in just two months, burning nearly 250,000 acres—about 390 square miles—and taking a huge economic and emotional toll. The worst of these, in terms of financial and heartbreaking loss, was the Substation Fire in July that started on private land southeast of The Dalles, immediately south of the Celilo Converter Station—a Bonneville Power Administration substation known as Big Eddy—before racing out of control through grass, brush and wheat fields. With 100-degree days and winds up to 35 mph, the Substation Fire moved swiftly, spreading 18 miles in just one day. Of more than 200 wildfires across Oregon, it was the largest. Four homes and 48 outbuildings were destroyed. The cause of the fire remains under investigation. The Substation Fire was just the beginning, as one fire after another consumed the vast and rolling landscape. The Substation Fire spread south toward Grass Valley and east toward Moro. 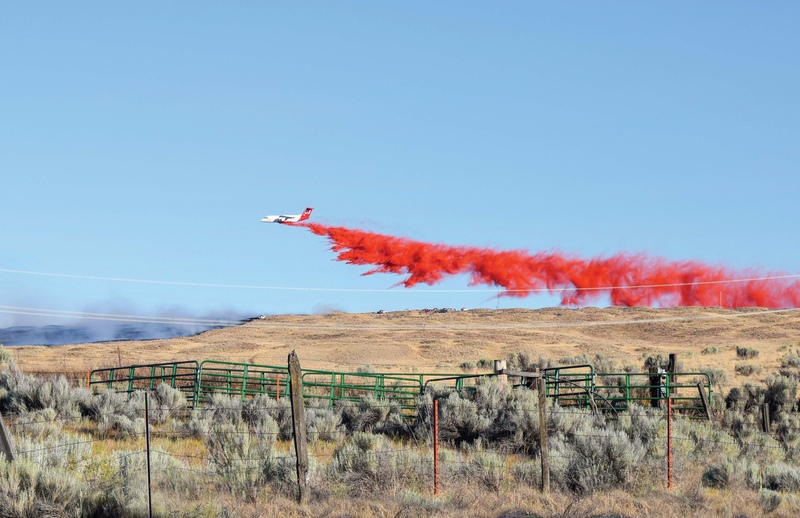 A week later, the Long Hollow Fire broke out southeast of Dufur abutting the Substation Fire. Just days later, the South Valley Fire erupted southwest of Dufur. As help arrived from across the state, farmers and utility personnel worked around the clock to control the blazes. Farmers are used to fighting their own small fires. Many say the quick, hard work of farmers helped manage the crisis. Wasco Electric linemen focus on protecting the system when firefighting. The crew is outfitted with two water-pumper rigs, three four-wheeler vehicles with firefighter tanks, and fire- resistant shirts as they help stop power poles from burning. Crews are trained to save a pole from fire, fix the line, safely restore power and stay out of harm’s way, says Operations Manager Casey McCleary. For many farmers, the immensity of the blaze was a shock. The house was saved, but power was lost when utility poles toppled across the road. “Wasco Electric was out there replacing poles as they burned,” Charlie says. Wasco Electric Cooperative crews replaced nearly 200 power poles and miles of line burned and damaged in the multiple blazes throughout the cooperative’s service territory. It was a big mission for the co-op’s five linemen. To tackle the task, everyone worked together—from linemen fighting fires to office staff answering calls from concerned members and making meal deliveries to crews in the field. In addition to Wasco Electric crews, Hood River Electric Cooperative and Northern Wasco County PUD pitched in, along with crews from Magnum Power, Sturgeon Electric Co. and Trees LLC, to help replace poles and restore power. Farmers and firefighters help battle the Substation Fire. For nearly a month, Wasco Electric Co-op linemen fought fires, dug holes, and set power poles and line for 18 hours straight, then went home for a quick rest and returned. “This is the worst year we’ve ever had, consistently back to back, just not letting up,” lineman Bo Gridley says. By late August, the crews were long past firefighting. They were instead battling bees and rattlesnakes as they dug into a routine of pole replacement. It’s a slow and long process, affected by soil, location and weather. The upside? Many of the new poles and lines have been repositioned closer to roads, providing easier access for future maintenance. There’s never a good time for a fire, but there is certainly a worse time. Just as the Substation Fire broke, farmers were preparing to harvest what was expected to be the best wheat crop in decades, and anticipating higher-than-average yields and trading at nearly $6 per bushel. Fields that normally would have cut 60 bushels per acre may have yielded upwards of 80 to 90 bushels per acre, according to Oregon State University Extension agents. About 100 farms in Wasco County grow soft white wheat, the area’s primary crop. The wheat crop value in Wasco and Sherman counties is about $46 million a year, according to the Wasco County Farm Bureau. Nearly half of the Wasco County crop may have been lost to the fire, according to reports in Capital Press. While most crops were insured, farmers say the reimbursement will likely pale compared to what they would have earned. A crop takes two years to grow because farmers leave the land fallow to improve soil and reduce erosion. Looking ahead, farmers are moving forward, picking up the pieces, rebuilding, stringing new fence and planting the next crop. It will all take time, but this community is built with resilient farmers who will continue to do what they do and work on getting back to what is consider normal. Wasco Electric will continue to focus on restoration of the distribution system: replacing additional burnt power poles, stringing new line and picking up damaged equipment before winter comes. Still, in this scorched landscape, small signs of normalcy appear. Deer nibble along charred fields, a buck darts across a blackened hill, a litter of cougar kittens tumble through the torched terrain. In a few months—maybe more—spots of green may emerge in the folds of this scarred but still promising land.